This is a story written by new Xp 55 owners, Julie & John Applegate; Julie & John left Denmark after a hand-over process at the X-Yachts yard in Haderslev in April 2018. The boat was loaded on a Yacht Transport Ship Sunday, 29th April 2018 in Lillebælt, close to the yard in Haderslev. The latest chapter is from 4th March 2019. Top image on this page shows the unloading of the boat in Newport, USA. Last blog Julie and I talked about the successful voyage from the Chesapeake Bay to the BVIs (approx 1500 miles offshore) where we put Serenity to the test. About 90% of that passage was upwind…and as we all know Gentlemen do not go upwind….well sometimes Gentlemen have no choice…..Serenity handled the high winds and high seas like a champ and it was through that process that we have an even higher level of confidence around her stability and ability to take on way more then we can. It is now the first of March and since we arrived in the BVIs we have totally switched modes…..from offshore passage to pure cruising mode. Please remember that we are part time sailers and full time workers….so we leave Serenity and fly back to the US to work for several weeks then fly back to her for a long weekend or sometimes more….My job dictates international travel so it is easier for us to fly back to the Caribbean then someone who works from a single spot. We left Serenity in the BVIs at the end of November and went back to work for several weeks till the Christmas and New Year holiday period….so we quickly changed from a mindset of offshore emergency preparedness to Caribbean sailing mindset (proper bikinis, dive tanks, right mix of rum and juices, …..). We had about 3 weeks on Serenity during this timeframe and our only focus was to end up in Antigua as that is where we had our Winter berth (Falmouth Harbor). We had an additional crew of two join us and that was Heather and her daughter Samantha. Heather is a captain of a X-482 based out of Newport and we met her in Haderslev when we did the handover for Serenity. Heather was getting her boat repaired at the same time and we quickly became friends. During those 3 weeks we went to Antigua, St Barts, Guadalupe , Dominica and finally Antigua…..due to the closeness of the islands we were able to sail to each island during the day and we got to pick our days, and I am glad to report that we even had a few passages of a beam reach and one was actually slightly downwind……how great that was compared to the 1500 miles of upwind sailing…..
-BVIs: Awesome cruising area but when you are there with your own boat…those charters seem to be aiming for your boat each time they come in to attempt to pick up a ball. -Anguilla: Prettiest beaches and waterline. Not easy to sail to from the BVIs as it is straight into the trade winds…..we went close-haul at 32 degrees apparent then one tack to bring us inline with Anguilla. We saved a lot if time by being able to point so high into the wind. -St Barts: The quick sail from the top of Anguilla to St Barts was one of the best passages of the trip. Sun was out, wind was manageable and tans were being worked on! If you want to visit St Barts around Christmas time then please show up in nothing smaller then a 200 foot yacht…..or you will be ignored….We stayed in a great bay on the north side of the island away from all the busyness of the spots around Gustavia. -Dominica: Big difference between Dominica and St Barts…..almost a culture shock for us…..Dominica’s inland spots are to die for…drop dead gorgeous waterfalls and other natural wonders. Worth a visit but be prepared to ‘camp’ a bit more than other places. -Antigua: Sailing capital of the Caribbean. Great mix of private boats that spend the season there along with all the industry to help maintain the boats. People are super nice and the place is deep in history. We like it so much that we are looking into keeping Serenity there for the summer season and placing her in a hurricane pit on the land during September and October (high months for hurricanes). We are still weighing our options so will keep you updated. One cool event occurred in Antigua when we arrived….we were in our slip and Samantha noticed a large dingy going by and closer inspection it turned out to the the entire sv Delos crew – she notified Julie then Julie quickly moved to the front of Serenity to wave her arms to get their attention…it worked …they stayed for the evening enjoying our special Serenity Painkillers (Heather created a new recipe that is awesome!). Delos is one of the largest YouTube channel focused on the cruising lifestyle with over 300,000 subscribers. We mentioned them in our first blog as they were very influential in us moving forward purchasing Serenity as we wanted their lifestyle!!! We will attach a pic of the Delos crew inside Serenity with this blog. The two great pics of Serenity sailing were actually taken by Brian from Delos as they helped us out when we needed quality sailing pics of her. We spent a lot of time getting to know the Delos crew as they were also based in Falmouth harbor for January & February and can now call them friends. Given the past few months we have put about 2,500 miles on her she was needing a bit of maintenance. Once we arrived in Antigua I worked with Stan at Antigua Rigging and he collaborated with X-Yachts on the repairs and maintenance schedules for the big items. All was done as I flew back to work. 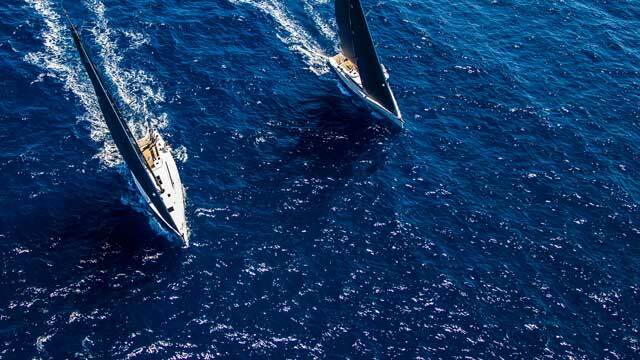 Looking forward we have another couple of weeks on Serenity as a cruising boat then at the end of April we will be participating in the Antigua Sailing Week event…so once again we will be altering Serenity to a different mode….this time pure racing!!!! We are so pleased that the DNA of this X-Yacht Xp Xp 55 allows us to change her ‘outfits’ to reflect the type of dinner parties we attend….so time to loose some weight and strip down the unnecessary canvas….Race Time!!!!!!! The big regatta was finally here... our months of planning, configuring, troubleshooting, and improving were about to pay off. Julie and I were days from pushing away from the docks and starting our first big offshore voyage. It seems that the real heavy lifting was not in getting the boat (X-Yachts XP55) ready, as we knew that sv Serenity would take care of us, but rather it was our mental readiness that took the longest to prepare. There were five of us onboard for this journey and all were there for a specific purpose: of course Julie and I were onboard as boat owners, and we also had Heather with us as she is a Captain of sv Foxtrot (X-Yachts 482 based in Newport, USA) and has years of offshore experience. Walt was the fixer as he knows how to fix everything, and Nate was sail trimmer, an expert who came to us from Warrior Sailing (wounded warriors that now focus on sailing). With the help of X-Yachts, we had to fully transform her from ‘boat show dress,’ as she was on full display at the Annapolis Boat show (and Sailing and Cruising World magazines), to full on cruising attire. All systems were checked and tweaked, jack lines installed on the deck, tent encloser attached to the dodger, inner-forestay attached to the foredeck with matching storm sail (just in case). Twenty-five extra gallons of fuel were tucked away in the dingy garage and 10 extra gallons of water were tucked in all over the boat. The watermaker was checked and ready to go, all tanks topped up, safety gear out and offshore life jackets on .... we were finally ready. We all woke up super early that fine Sunday morning, anxious to get going .... but wait ... the weather report from two independent professional services were both saying that today would not be a good day to depart. The rest of the fleet (World Cruising Club Caribbean 1500 rally) consisted of 22 other boats making the 1500 mile journey from Portsmouth, Virginia, USA to the British Virgin Islands all decided to head out on that Sunday morning as originally planned. The fleet was a mix of catamarans, trimaran, and monohulls of different types - Gunboat 60 all the way down to 42 foot monohull. It was extremely touchy to sit on the dock and see everyone else depart .... makes you ponder the notion of how you could be wrong and they are all right. At the end of the day, it is up to each captain to decide when to depart and with the help of the weather experts and Heather it was agreed we would delay 24 hours and depart Monday morning. Later we realized that the hardest part of this journey was sitting on the dock watching all the other boats head out. I am writing this blog on Monday morning exactly one week after we started and we are 50 nm from our finish line in the BVIs. Almost there .... it looks like we will finish about two hours after the Gunboat 60 (elapsed time) and in front of all others. There is this Amel 54 that will cross the finish line before us but we did give them a 24-hour head start. All other boats are behind us - not bad for our first offshore rally. This trip has taught me a few things about sv Serenity and the people she is protecting ... she is much stronger than we are. The first three days were not the most pleasant sail as we had high winds, weird sea state and a Gulfstream that was just starting to settle down. Once we had our course established to cross the stream, we then focused on getting the right sail plan and getting everything balanced ... so for those two days she was double reefed and only a small patch of jib was out. Winds were 35 degrees apparent and blowing 20-25 with gusts above 30. Serenity was balanced and stayed that way for two days just riding the waves and making speed through water of 9 to 10 knots. The last two days have been steady wind speed of 18-22 knots apparent with the wind angle fluxing from 40-65. Most of the seven days of sailing was upwind as well as no wind. We did not really find that perfect 12 knots of beamreach trade winds but we all still had a blast. Getting back to my original point in this paragraph, we could have pushed Serenity a lot harder but it was the comfort of the crew that took priority. It is nice to know that when needed, our X-Yacht could deliver up the goods and raise her skirt and go a lot faster if needed. This last point almost become a necessity for us as a few days before our arrival we got notification of a tropical storm coming close to the BVIs and all ships needed to get into the BVIs before Tuesday or divert to Bermuda or Turks & Caicos. Due to Serenity’s speed and riding comfort we were already way head of the main pack (did I mention that we started 24 hours after them? ), so this news did not impact us given our arrival time at the BVIs was Monday. Once again it was awesome to have speed on our side given we elected to delay our departure due to weather and we then needed to hurry up and get to our destination before a big storm came blowing past. Even with the tight weather window, we made it. I cannot say that for 50 percent of the fleet. Unfortunately, only half the fleet arrived in the BVIs. The other half were beaten up pretty badly at the start and had to head-in for repairs or were not fast enough to get in before the tropical storm and now have diverted to other islands to wait for this tropical storm to pass through. At the end of the day, we all had a great time, learned lots, experienced way different weather situations and gained huge amounts of confidence in the boat and ourselves. At that time Serenity was just being placed on top of a big ship (along with 6 other X-Yacht littermates) and heading to Newport USA. We picked her up in Newport and made our way to Mystic CT USA where she is spending the summer months - right next to the US X-Yachts office!!!! Our plan was to use this summer as our ‘training wheel’ time period as we want to get use to the boat and have the comfort of having X-Yachts right next to us. Well turns out that plan was spot on. -Reading the manuals.... all of them!!!! -Getting familiar on how to move a 55 ft boat around tight quarters with wind and tide... need to learn now and no sense putting this off. -Adhering to US safety, tax and registration issues. Big big task but the folks at X-Yachts USA made this much easier. -Getting use to putting a dingy in the garage. You look at the pics on the brochure but actually getting that dingy in that garage takes some getting use to. But once you get the process down it takes no time at all. But having said all that ... the past couple of months of getting Serenity cruising ready has been a blast. It is nice to transition from spreadsheet planning to prepping your own boat. One last thing we would like to mention is that the more and more we get to know Serenity, we appreciate the level to detail that X-Yachts have built into the boat - especially the insides of the boat. The level of neatness, labelling and attention to detail is impressive. And for anyone that has ever tried to trace a cable or pipe from one end of the boat to the other will also appreciate this aspect. In our last post we provided a bit of background on our journey from “defining our joint passion” to the arctic-cold handover of SV Serenity in Denmark. That process took about two years and that time was filled with many choices and options as we spec’d out our dream boat. While the boat was still on paper, we came up with a lot of wonderful ideas like the Newport-Bermuda race, Caribbean 600, Antigua sailing week, World Cruising Club’s ARC and Caribbean 1500, Fastnet Race, anchored next to an empty white beach, moored next to a great wreck dive, spending a weekend inside as it rains hard outside, Marion to Bermuda Race, BVI Spring Regatta… Then you apply reality to the situation and remember that you still need to actually work and some of these events are far from each other and are not run every year. Before the November 2018 Caribbean 1500 we will spend time in New England close to X-Yachts’ USA base as we think it would be good to have them nearby while we get comfortable with Serenity. We have not spent much time in New England so we are anxious to explore that part of the US (Mystic, Newport, Block Island, Cuttyhunk, and Martha’s Vineyard), so we are looking forward to spending the first summer there before we head to Annapolis in early October. After that we will participate in the Caribbean 1500 to get her down south before winter settles in. We have committed to the Caribbean 1500 as we want to do offshore passages and prefer to do our first one with many other cruisers, a ”strength in numbers” type of thing. Plus, we have participated in a few offshore seminars (World Cruising Club) to expand our knowledge. She will spend the early part of winter in the British Virgin Islands then, depending on the status of the BVI infrastructure, we may cruise down to Antigua during the Christmas break. One of the big unknowns after that is where to place Serenity after June 2019. Given the hurricane season we need to be outside of the hurricane belt as we prefer not to play dodge the hurricane with our boat. The answer depends on how much we enjoyed New England and if the long journey back to the US is worth it. Other options would be Bermuda, Grenada, Bonaire. It is good to have choices, but we will leave that choice for a later date. Just to remind everyone that our plans are to work-cruise Serenity for the next six years, so we have to be careful that we don’t try to cram too much in early on. Maybe this first year we will focus on getting her bedded down in New England, stretch her legs in the Caribbean 1500 and nice anchorages in the Virgin Islands / Antigua then head back to the US in June. In year two we will probably do more “Regattas” as we have heard the Marion-Bermuda regatta is fun. This is why we love the concept of owning a moving apartment, we can go anywhere we want to go (as long it will be deeper than 9.5 feet / 2.85 meters given the draft). Thinking of our next post, we will get into more detail about our choice of a monohull vs a catamaran and why an X-Yacht. To have an effective conversation about those topics we need to better define our main purpose for the boat (short and medium term) as those purposes drive priorities which transform into selection criteria. We will leave you this time by sharing with you what those purposes are. -We want a place to spend our time together (along with friends and family) that is flexible and fits the way we want to live. Meaning comfort, not being cramped, and very secure at sea. -We want to spend our time moving her place to place with at least two big offshore trips a year. We love to do things ourselves while we take our sailing education and apply that to our adventures. Adventure to us is more than sitting at the harbor or a pretty anchorage – we need to get out and push ourselves. -We want to experience more of the cruising life when we are not working. That entails taking it down a notch and just flowing with surroundings. Sometimes our lives are just too much go-go-go and this is our space to slow down. -Last priority would be to dabble in fun racing once our confidence level increases as we are both very competitive and we know that this would fire our jets. They say that it is all about the journey, not the destination. For us, Julie and John, that sums up our core value in life. With regards to obtaining an X-Yacht, we would have to throw in a few more words besides “journey” to tell the whole story, words like “passion,” “goals” and “focus,” as those four words added together enable us to be standing on the deck of our new XP 55 (Serenity). A bit of background: John has been sailing for a long time and at one time had an X-Yacht X-46, but there was a 13-year gap during which he did not sail at all. Julie was new to sailing but she was the one who actually brought up the possibility of getting a sailboat. So this was not one of those typical stories of husbands trying to convince the wives to get a boat! It all started a few years ago when we found some great videos on YouTube that were focused on the cruising lifestyle (Delos, HappyTogether, Out Chasing Stars, Sailing Britican, and Chase the Story in particular). Those videos were fun to watch and we fantasized about living in that “other world;” we talked forever about living in that “final destination” (meaning retirement). While we were both avid SCUBA divers, we had not focused on sailing until we started watching these videos. They brought both worlds together and that planted a seed in Julie’s mind. There were a couple of events that took place that caused us to shift from a fantasy to reality. We knew that we would not sell all of our possessions and purchase a used Amel and just head south then west as Delos had done. We had jobs and other commitments that kept us firmly planted in the real world. The first event for us was watching Sailing SV Happy Together on YouTube as their postings resonated with us more than the others given they both still worked full time jobs. They would focus on their work and once a month(ish) would fly to wherever their boat was and take her to the next port. They very much enjoyed the journey rather than focusing on each destination. Over two years that journey has taken them from Florida all the way to San Francisco, all while maintaining full time jobs - very impressive! They would drop the boat off at a new marina at the end of each trip till they came back next month to continue the journey to the next location. For us that brought to our attention that one can enjoy cruising while working and, if you are willing to spread that journey out over time, the two worlds (cruising and working) can commingle. The other key event was a discussion that we had regarding our long term plans. We wanted to work on our journey as we had not really defined what we both wanted and how we were going to mix that with our passions and our goals. It was Julie who first brought all those elements together and suggested that we take the Happy Together concept and apply their journey to ours. We had talked for some time about getting a boat and cruising around the world once we retired. It was in this conversation that we decided to take that high-level generic statement and begin to convert it into obtainable goals. •	Retirement was too far off and there are too many unknowns between now and then (e.g., health). So we focused on early retirement (2025) and worked our plan back from there. •	We wanted to head west from the Caribbean in 2025 as we did not want to take early retirement then spend a couple of years in the Caribbean. We are taking the Happy Together example and “work-cruising” New England and the Caribbean from 2018 - 2025. That will give us plenty of time to explore those two regions given work and family commitments are still top priorities. •	We decided on New England and the Caribbean as those two locations are relatively close to home (Dallas) and are easy flights. Plus keeping Serenity in New England for the summers and the winters in the Caribbean will enable us to dodge the hurricanes. •	From the time we agreed the plan we created what our short term goals needed to be and those included education, experience, boat selection, budget consolidation (i.e., stop wasting money on items that do not allow us to achieve our plan). Our handover process in early April 2018 in Denmark was the achievement of our first major milestone. We are now well under way on our journey and all it took was us defining our goals, applying a sensible plan and remaining focused through all the ups and downs.